When Sarah and her husband trade in a crowded commute, cramped apartment, and high stress New York City jobs for life the slow lane in Farmwood, VA, the pressure is on to have a baby. At thirty-six Sarah knows it's time to get started, but the urgency motivating her to reach this pinnacle of self-fulfillment looms large. Meanwhile, her best friend Mona, a single and successful editor who's always wanted children, is diagnosed with cervical cancer. At the same time, Sarah's younger and seemingly perfect sister-in-law has just given birth to her son, Franklin. When Sarah uproots her new life with her husband in Virginia to return to New York and care for Mona, the three women will help each other navigate their new realities. I quite enjoyed Driving Lessons for its simplicity with depth- if that makes sense? Zoe Fishman gave us quite straight forward characters with a fairly direct story line but also made the people feel realistic and their situations plausible. We could probably have done with a little less of the small town stereotypes , it took something away from Sarah’s character on occasion, but perhaps Fishman was trying to leave a contrast between the stereotype and the genuine and likeable people that Sarah befriends in her new home town. Sarah and her husband’s interactions were realistic and sweet. I sometimes wished that Sarah wasn’t quite so close lipped about her fears on motherhood, we are given an explanation about her own relationship with her mother to explain her fears, but I still felt a bit frustrated that she was managing to keep all these things inside without Josh having a clue. The remainder of their interactions were honest and open so this seemed a bit off character for them both. I mostly appreciated Sarah’s bravery in deciding to abandon her career and make a new start. She was clearly supporting her husband’s new job despite fumbling around for a while and trying to figure out what she wanted to do next. There was a good balance of feeling sorry for herself and trying to get on with it! My favourite scenes were actually between Sarah and her best friend Mona as well as the emerging closeness between Sarah and her sister-in-law. I thought they were fresh and honest and made me smile even while Mona’s cancer diagnosis was so raw. 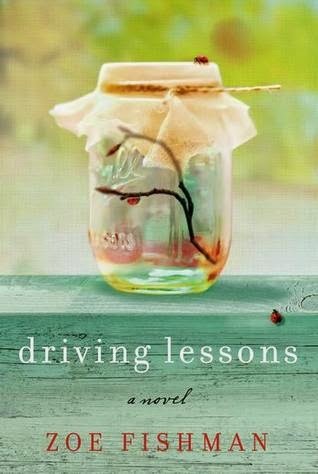 Driving Lessons wrapped up with ease, it did not bring any real surprises but I enjoyed the novel and there was a fresh voice to be found in it.